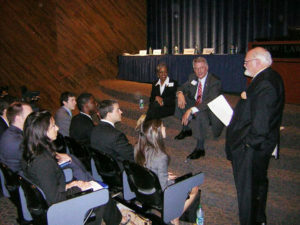 Introducing the concept of professionalism to law students early in their careers. Evaluations of the Professionalism Orientation Program for most of the schools are available here. Student Materials for most of the schools are available here. Group Leader Handbooks for most of the schools are available here. Please e-mail kygrier@cjcpga.org for the password. We look forward to welcoming judges, attorneys, and law students at the 2018 Law School Orientations. If you have questions, please contact us at (404) 225-5040.